This month, the Lady of Boxing will defend her flyweight title. But she's got a bigger uphill battle ahead. Ava Knight is studying accounting. Before Ava Knight started boxing, she took ballet classes. Not seriously, said the 23-year-old flyweight champion, but concertedly enough that she retains that grace and elegance whenever she enters the ring. That was evident last Wednesday morning, as Knight practiced sparring with her trainer, Ben Bautista, at the Boxing for Health gym near Lake Merritt. Petite, with powerful biceps and sinewy abdominal muscles, Knight landed a series of swift, exacting punches on Bautista's mitts. The two of them skulked around the ring like dance partners doing a pas de deux, Knight wearing ten-ounce gloves and baggy sweatpants, Bautista murmuring encouragement with each satisfying thwack. It was a routine they'd followed every day for the past few weeks, and they'd persist right up till the end of June, when Knight was slated to defend her International Boxing Federation flyweight title against Mexican boxer Susana Vazquez in Torreón, Mexico. The six weeks leading up to a big fight are arduous. Knight spends them in a kind of self-enforced boot camp, sleeping in a small room in the back of the gym with her Doberman, and rising early to run three miles around Lake Merritt. She trains for about four hours a day, abstains from processed food, and even stays away from her boyfriend. Boxers have a long tradition of asceticism and self-flagellation when preparing for big fights, and Knight is no exception. "That's just the code, basically," Bautista explained. One of his other fighters, Troy King, concurred. "We call it 'thuggin' it out.'" Knight can thug with the best of them, even though she's disarmingly polite and delicate in person — not for nothing did former coach Joe Rodriguez nickname her "The Lady of Boxing." A self-described loner, she first entered a boxing gym in her hometown of Chico at age thirteen, took to the sport easily, and began competing a year later. It seemed like a perfect fit. Knight has the agility and hand-eye coordination required of any good fighter; moreover, she likes gladiatorial sports that rely on the power of the individual. She trained in Chico for eight years, then moved to Oakland to join Bautista's stable, dividing her time between Boxing for Health and his San Francisco outpost, the Straight Forward Club, where she trains with heavy-hitters like Karim Mayfield. 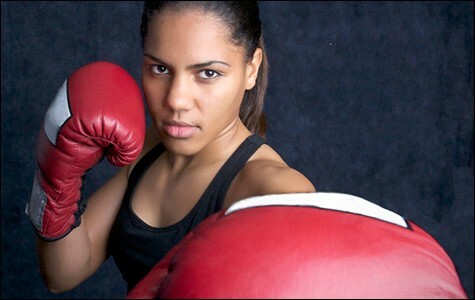 In 2008, she won the North American bantamweight title after eight grueling rounds sparring rival Kaliesha West. 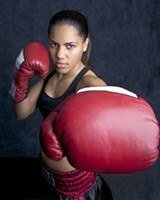 In 2011 she took the IBF flyweight title by knocking out Mexican boxer Arely Muciño. She defended the title in March, after defeating Thai challenger Vacharaporn Prachumchai in another ten-round bout. At a time when women's boxing is gaining pop-culture currency — it will be featured in the Olympics for the first time this year — Knight is one of its best practitioners. But if she wants to pursue it professionally, she faces an uphill battle. While male celebrity boxers like Floyd Mayweather can command up to $45 million a match (which was his payout for the May 5 fight against Miguel Cotto), most people in the lower ranks barely eke out a living. In an October profile for SF Weekly, writer Joe Eskenazi pegged Mayfield's highest per-fight earnings at $11,000, which is a pittance for an athlete who only gets about three fights a year. King said the average boxer's salaries are so low that most of them have day jobs — one of his friends works in a scrapping business and moonlights in the ring; others get by working as trainers. And Knight said that women make far less than their male counterparts. "The average female championship is four figures," she said matter-of-factly. "Most of that money goes back into training." In fact, living in Oakland proved cost-prohibitive for Knight, who now spends most of her time in Chico and stays in the Bay Area only to train for a big fight. "Times were getting hard over here," she said. "I couldn't find a job." Knight studied accounting at Butte College in Chico and says she'll probably pursue a career in that field, and continue to box on the side. In the meantime, she's trying to find business sponsorships to defray the cost of training. So far she's landed one with Muscle Milk, but the company hasn't given her any cash — it only gives her free bottles of its flavored sports beverage. At this point, though, she'll take what she can get. But it isn't just a dearth of sponsorships that create obstacles for female boxers. Even more vexing is the scarcity of women to fight. Retired boxer Sue "TL" Fox said that because the scene is so small, pros like Knight have trouble securing enough matches to generate a decent income. And the problem is circular: Fewer bouts means that fewer boxers will participate in the sport full-time, which in turn prevents the sport from growing. That also guarantees that women champions will always spar for a lighter purse. Smallness could easily be the undoing of women's boxing, given that the sport depends so much on visibility and hype. Unlike other pro athletes, Floyd Mayweather and Manny Pacquiao aren't selling out stadiums on a regular basis; their salaries come from lucrative TV contracts. The Mayweather-Cotto fight alone generated $94 million in domestic pay-per-view revenue, which means there's enough of an audience to make boxing one of the most high-profile sports in the world. Mayweather has only fought one match this year, but he ranked at the top of Forbes' list of highest-paid athletes. Clearly, female boxers — and most pro male boxers, for that matter — will have to create a similar cult of fandom if they ever want to see real paper returns. That might not be achievable anytime soon, but with all the media hype surrounding this summer's Olympic games, things are looking up. Knight avidly follows pro boxing, and she's well aware of its disparities. "Did you hear about that?" she asked, marveling at Mayweather's Forbes ranking. The young boxer simpered, casting her eyes at a giant, gold-plated belt that lay on a folding chair by the gym wall — the decoration for her flyweight title. It looked gaudy against the black-and-gray palette of Boxing for Health, with its mirrored walls and Everlast bags. The gym had once been a ballet studio, and it retained the old venue's hygienically barren decor. Knight was wearing a Muscle Milk sweatshirt — another gift from the company — and preparing to shadow-box with Bautista. Only ten days remained before the bout with Vazquez, and she still had to drop about 6 pounds to make the required weight of 112. That meant lots of running, no carbs, and no water on the day of the weigh-in. The next few days would be rough. Win or lose, though, Knight would take home a few thousand dollars. It's not a living wage, she concedes. But it's enough to keep her going for a while.